England’s health service is raising awareness of cancer and working with medical device firm Covidien to launch a cheaper and faster diagnostic to help tackle oesophago-gastric cancers. Countries around the world are facing a steep rise in the number of people requiring treatment for cancer, with new estimates suggesting that 1 in 2 people in the UK will be diagnosed with cancer at some time in their lives. The newly updated estimates recently released by Cancer Research UK, show an astonishing change in the diseases affecting developed nations. Fewer people now die from heart attacks and strokes, and instead go on to develop other diseases, such as dementia or cancer in their 60s, 70s or 80s. This rise in cancer cases is thanks to improved healthcare and longer life expectancy, but is adding an extra burden to the finite budgets of health systems around the world, including England’s National Health Service (NHS). So what can be done? The quest for a cure for cancer goes on, but in the meantime, its impact on patients and society must be contained. A big part of the answer lies in preventing as many people as possible from being diagnosed late, when the cancer is often advanced and a patient’s chances of survival are much smaller. Even better, if public health campaigns can persuade people to lead healthier lifestyles, incidences of many cancers would fall. The NHS in England is now pioneering a range of ways to identify cancer earlier and ‘nudge’ people towards exercising, eat healthily, moderate their alcohol intake and stop smoking. There has been a lot of talk about turning the NHS in to a ‘health’ service rather than a ‘sickness’ service over the years, but this transition is a tough one: moving away from simply treating people once they have a disease to preventing that disease requires a radical change of approach. Getting one step ahead of cancer starts with tackling late diagnosis. There are two parts to this – firstly, getting people with suspected cancer to visit their doctor and secondly, improving the speed and accuracy of diagnosis. Despite major improvements in cancer care in the UK, the country is still lagging behind comparable countries in Europe when it comes to cancer survival: one-year survival rates are around 68-69 per cent in the UK – compare that with Sweden, which has one of the best records, at 82 per cent. This translates into between 5,000 and 10,000 more lives lost in the UK every year compared to similar countries with better early-detection in place. The NHS in England is addressing the awareness problem with its ongoing ‘Be Clear on Cancer‘ publicity campaign, aimed at educating people about some potential tell-tale signs of cancer. The long-running campaign has now been extended to oesophago-gastric cancers. This group of cancers, affecting the oesophagus (or ‘food pipe’) and stomach has been singled out because it currently has very poor detection and survival rates: the UK, with the Netherlands, has the joint highest incidence rate of oesophageal cancer in males in the European Union and the highest incidence rate of oesophageal cancer in females. It’s not entirely clear why the UK has such high incidence, but smoking, not eating healthily, rising obesity levels and high alcohol consumption are all known to raise the risk of developing the cancer. Public Health England says around 12,900 people in England are diagnosed with oesophago-gastric cancers each year, with approximately 10,200 people dying from these diseases annually. This equates to 28 people dying from either oesophageal or stomach cancer every day. This makes the cancers the fourth and fifth most common cause of cancer death in men and women, respectively. The NHS says around 950 lives could be saved in England each year if survival rates in England for oesophago-gastric cancers matched the best in Europe. Of those diagnosed with oesophago-gastric cancers, almost all are over 50, so the new campaign has been targeted at this age group. Launched at the end of January, the four-week campaign is currently running across TV, radio and in the press in England, with events taking place at a number of shopping centres across the country. The aim of the campaign is to get more people with a suspected oesophago-gastric cancer to visit their general practitioner (GP), which should lead to more cases of the disease being detected and treated earlier. 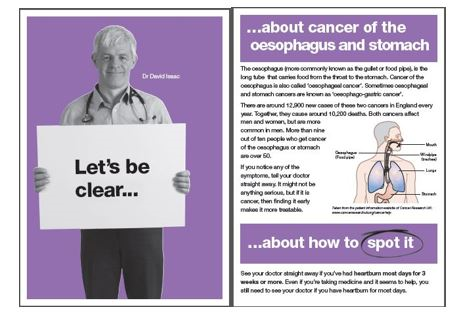 The campaign in particular identifies the symptom of persistent heartburn, as this is known to cause the inflammation of the gullet called Barrett’s Oesophagus (BE) which can, in turn, lead to the cancerous oesophageal adenocarcinoma (OAC). Once detected, the inflamed tissue characteristic of the disease can be surgically removed (by ablation) and thereby prevent it progressing to cancer in many cases. The figures show that around 67 per cent of patients diagnosed with OG cancer at its earliest stage survive for at least five years, in stark contrast to just 3 per cent at a late stage. However not everyone is convinced that the awareness campaign is a good idea – doubts have been raised about evidence that it can increase early diagnosis. These doubts mirror the experience in screening programmes for other cancer types, but more research is the best way to settle these controversies. There are also concerns about an influx of cases putting more pressure on NHS resources, both in general practice and for endoscopies to investigate the oesophagus and stomach. But GPs in the north east of England where the initiative was piloted say the workload increase was manageable. Gastronenterologists in the pilot say the extra workload was significant, however, which suggests that this could require new approaches. An ingenious new medical device has been developed in the UK which could provide a faster, cheaper, but equally effective alternative to an endoscopy. The Cytosponge is a gelatin capsule attached to a string. When patients swallow the capsule, it dissolves in the stomach, releasing a sponge-like mesh which collects tissue samples as it is withdrawn from the patient – a process that takes moments. A trial involving 1,000 patients has shown the Cytosponge to be as safe and effective as an endoscopy in detecting the condition – and was also preferred by patients because it is quicker and less invasive than an endoscopy. The simplicity of the procedure means the Cytosponge can be used in GP surgeries and doesn’t require any sedation, unlike an endoscopy. The device is also cheaper, with early estimates putting its cost at £25 compared with the £600 cost of a traditional endoscopy. The Cytosponge has been developed by Prof Rebecca Fitzgerald and colleagues Medical Research Council (MRC) Cancer Unit at the University of Cambridge, and larger trials are now under way. It has now been licensed out by MRC Technology to medical devices company Covidien, which plans to commercialise the product. The company already markets devices which carry out ablation for patients with BE; its potential to allowing more patients to be screened at a lower cost means that it could be an example of that much sought-after ‘win-win’ partnership for the NHS and the private sector. The development and commercialisation of a new medical device originating in the MRC also makes it a model for how the problems of cancer diagnosis and treatment can be solved through collaboration and joined-up thinking. However the development of new technologies is only the beginning – to ensure wider uptake of the new diagnostic, clinicians in primary and secondary care will need to be consulted and included in a re-design of services around the new technique. The NHS will need to keep up this kind long-term approach to tackling cancer if it is to improve services and minimise costs. Public health initiatives, as well as multi-stakeholder collaborations will also be essential in order to make in-roads against oesophago-gastric and other hard-to-tackle cancers. 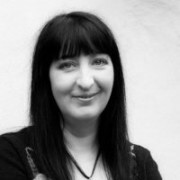 Andrew McConaghie is pharmaphorum‘s managing editor, feature media.